Contrary to the title of this post, I really am not concerned with whether or not Santa Claus has diabetes. But what I am thinking about is how to gently guide families that are new or experienced to the holiday with a safe and easy plan to incorporate type 1 diabetes with their usual celebration. Last year, I spent some time typing up a how-to post for new (and veteran) families. In our home, we plan to use the same well-worn strategy for Christmas once again. Here it is again, with a few new hints. 1.) Have a game plan. Take a few moments and write down a schedule of how you would like to see the day unfold. Be sure to include eating times and menus. Also, be sure to designate to the kids where a go-to basket of emergency low-blood sugar items will be kept. In the basket, place a meter, strips and alcohol wipes. For us, I have found that tucking this basket in mom and dad's bedroom works great. That is the one area of the house that guests are not in and it tends to be quiet and calm. It also works great for kids that need a bit of down-time from the constant activities and noise. 2.) Think ahead. Look over your prescription list and make sure that you will not be running out of any necessary items like insulin, thyroid hormone replacement, syringes, glucose or even child cold and fever medicine. Have the phone number handy for an on-call pediatrician, endocrinologist, a 24-hour clinic or a holiday pharmacy. Chances are you won't need it but it will be one less stressor to worry about. Even if you forget to put the morning food into the oven, you can have a fall back. This is an awesome strategy. I found that having some boiled eggs handy help in case a child dips into a candy filled stocking. Presto Protein! 4.) Give kids some guidelines. Sure, they want to run into the family room as soon as they wake up to see what Santa brought but as any parent knows, having them get there too soon would be a loss in getting a few of those first moment of wonder and awe pictures. Explain to the kids that no one is allowed to go into the family room until mom has her camera AND blood sugars are checked. Mom can take the ultimate part of this blame so that the Diabetes Monster stays out of the picture. Just be prepared for a few eye-rolls. Having your diabetes basket prepared ahead of time will work for this too! 5.) And finally... charge those batteries in your cameras and camcorders. 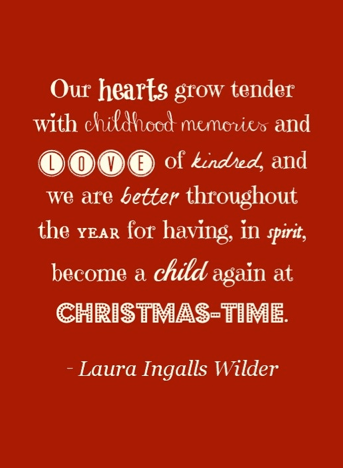 Every year, I am so caught up in making sure that Christmas goes off without a hitch and I often forget the most important part... capturing those magical holiday memories forever. And be sure to sneak in a few selfies or photo bomb if your spouse is in charge. After all, you want to be part of the holiday magic too! My sweet friend called the other day to vent about the icky, sticky, sweet mayhem happening at her daughter's holiday party at school. Listening to her vent, it occurred to me that this is quite possibly the first year that I have not had to deal with that very same issue. Both daughters have moved on to upper grades which no longer host elaborate birthday, holiday, or even end-of-year parties. The kids are in school to learn. Shocking, huh? I should feel sad, right? Because really, this means that my kids are growing up. And in a way, I do, especially if I think about it like that. Mostly though, I don't. One of my most favorite posts of all is called Classroom Holiday Parties (or What Stinks?). I also had a laugh at this old one where in the comments section I mention once again, classroom holiday parties. It was a repetitive problem, apparently. The truth of the matter is that the school holiday party (or insert anyone of the other millions of food-based celebrations in elementary school) is a challenging event to balance for our families living with type 1 diabetes. I have written about it several times because we were at a school where every single event was celebrated with food - Hello book fairs and bake sales, field day and mysterious green smoothies, walk-to-school and free bananas (true! ), or my favorite, weekly popcorn, ice-cream and cookie sales geared towards the children. Over the years and through many school party experiences, I tried to come to terms with how to juggle blood sugars, junk food and my child's happiness. But no matter how hard I tried to make it all better, it still was stressful - for me AND for my child. The problem is this: as a mom of two with type 1 diabetes, I am always advocating for the rights of my child. They can (and should) embrace and enjoy every part of life. Remember that well-worn phrase of mine? Kids first, diabetes second. 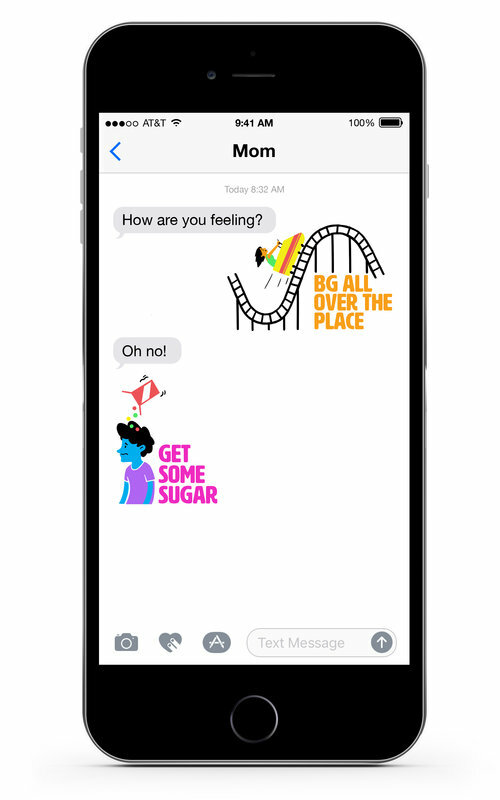 However, when you live with type 1 diabetes, especially as a child, having a school celebration is almost a guarantee that your child is going to automatically have higher-than-normal blood sugars just from the pure excitement. It doesn't matter if a single drop of food hits his/her mouth. Trust me, the adrenaline boost alone will easily send them into the 200 mg/dl and beyond. Little people with big blood sugar swings - that could be the name of a TV show. Unfortunately, since the kids are not in their natural home environment (giving a nod of understanding to why some families choose homeschool), it is super difficult to bring those blood sugars back into line without having a major downward spiral from low blood sugars. Not to mention that given a young age, even feeling a blood sugar rise or fall is a tricky thing. Kids are so preoccupied that they don't stop to listen to what their bodies are trying to tell them. The other quandary is how to then add an assortment of unknown party food, measuring, counting carbs and determining ingredients AND dealing with the already higher-than-normal blood sugars. Quite often, especially if you are a working parent, you are doing this remotely and relying on either your 8-year old or a staff member to help. Even if you are standing right there, trying to figure out how many carbs Mrs. Smith's prized chocolate fudgy brownie boats contains is a nightmare. Even using the SWAG (super wild-assed guess), you are still bolusing insulin and only able to hope for the best. To add to that, you are also dealing with deflecting comments of which kind of diabetes your child has and also the, 'Yes, she can eat that. Whether it is carrots or cookies, everything requires insulin' while double - while checking that your child actually finished Mrs. Smith's prized chocolate fudgy brownie boats because you already gave them insulin for it. 'Yes, you have to eat all of it! ', which again confuses everyone around you, especially because you are talking to a diabetic! Towards the end of fourth grade for my youngest daughter, I pretty much had answered and discussed type 1 diabetes so much that the final holiday parties were much less cumbersome. She was also older, more aware and more able to manage much of her own daily care. It only took six years to get there. So to all of you moms that are still dealing with this, I applaud and encourage you and your little one. In the same way that I did with my Naturally Sweet Sisters, you will get through this time in life too. Just remember that it is only one day. One party. One event. One memory. And be sure to take a lot of pictures. Because they do grow up quickly! I explained that our first DexCom G4 Platinum transmitter battery died a few weeks ago. You know, that little beloved piece of technical happiness that we call 'Sigums' as in CGMs. After a little bit of debating between the Medtronic 530g and another go at the DexCom, we opted for Sigums Jr.. The second Sigums wasn't nearly as wonderful as the first. Our shipment included two brand-new receivers, two brand new transmitters and a box of four sensors for each of the girls. The girls stayed loyal to pink and other than a change of serial numbers for the transmitter battery, pretty much everything was the same. On the advice of a fellow t1d'er who knew of our history of losing a receiver, he suggested that we keep the new receivers boxed up and continue with the old. I thought that idea through and it seemed like a terrific way to have a 'spare' new-in-the-box transmitter should anything go wrong with, ahem, skinny jeans and shallow pockets. A few days in to wearing the new Sigums and it was evident that our great success at having numbers coordinate with the blood sugar meters was lacking. In fact, the girls were randomly finding 100 point spreads +/- 50 at any given point during the day. Calibrating the Sigums only made it worse and on day 3, we actually had a sensor fail. None of it made sense, so we decided to try a restart without removing (and wasting one of our expensive $100.00 market priced sensors - out of pocket for us is $38.70 x 2 each month). Finally, four days in and while most households were sleeping, ours was struggling with complete DexCom meltdowns. Final error: "Replace Transmitter Battery Soon". What??? This IS a brand-new transmitter. With DexCom's 24-hour technical support line, I placed a middle-of-the-night call to a kind CSR who asked that I direct send our data from the receivers. She in turn forwarded it to her supervisor who declared it to be the 'the worst and weirdest' that he had ever seen. With little discussion, she immediately decided to send us two brand new transmitter batteries, which arrived via FedEx 36 hours later. 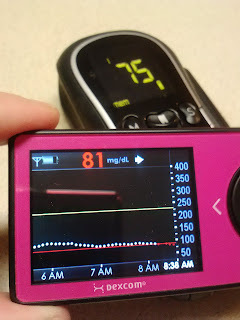 What I find odd (and the DexCom people did too), is that both of the transmitter batteries had a malfunction. I decided to post this situation in case there potentially was a bad lot. Or as another theory, perhaps the winter cold somehow depleted the battery in transit. It could also be a problem with the old receivers. After this happened, I decided to box up both of the old receivers and to start using the new ones. I am not going to take my chances with our 1-year old equipment, even though it had been functioning perfectly. If we lose one, than perhaps we will try it again, but for now, we are going with the new. As I write this, it has been about 10 hours since we inserted, calibrated and set up the new DexCom systems. All is well. The girls weren't sure if they should continue to call our beloved device Sigums or something new. One daughter suggested 'Herbert'. The other said, 'Eddie'. And why are these always boy names??? But I have to tell you, I can't stop with the 'Sigums'. I think it is here to stay. On Tuesday, I was invited to speak on behalf of JDRF in an attempt to obtain community service fundraising from a local high school. The school had asked four different organizations to come and present a bit about their efforts and how they would spend the money that the school raised. It was a fun opportunity and I was excited to help JDRF as the school would provide about $25,000 to the lucky charity of choice. To me, that seemed like a wonderful way to kick off 2014 and to help step a bit closer to a CURE! 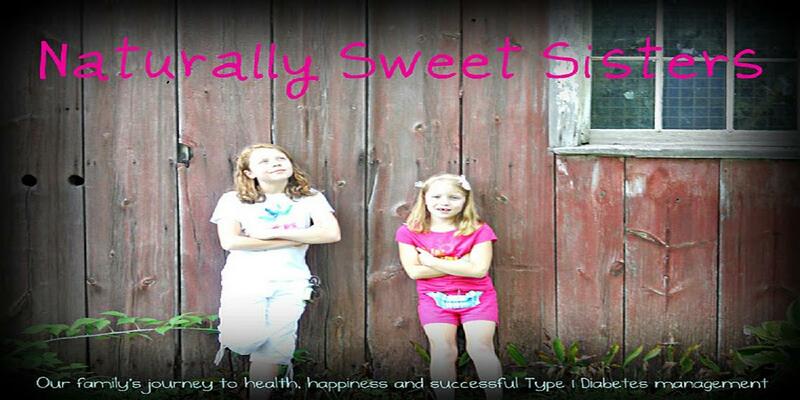 The night before the high school event, everything in our Naturally Sweet Sisters type 1 diabetes world went wrong. Our brand new replacement DexCom sensors, transmitters and receivers all took a major dump and failed miserably. Starting at 10:00 p.m., with an alarm stating 'Replace Transmitter Battery Soon' to a false 'UNDER 55 mg/dl WARNING', I was running between bedrooms non-stop. The Naturally Sweet Dad was of little help as he had to be out the door by 6:00 a.m. for a conference and needed every ounce of sleep he could gather. By 3:00 a.m., I was in tears. While the first under 55 mg/dl warning was faulty, the second one I actually caught just from randomly testing blood sugar - no warning from Dex. I woke up our oldest daughter, had her drink two juice boxes and waited until she was in safe range. 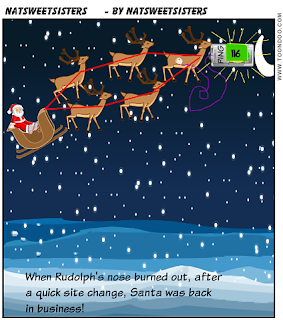 After that, I went to the computer and called DexCom, demanding two new transmitter batteries be sent overnight. The DexCom CSR was as kind as could be and listened while I went through all of the issues. She then, gently told me that I should try to get some sleep and that the replacements would arrive on Wednesday. On a side note, you know you sound fragile when a CSR, whom you have never met, is mothering you via a phone line. What a compassionate person... She knew that I needed some kindness! So I tried to follow her advice, but sleep was evasive. Only when it was time for me to wake up at 6:00 a.m. to start our daughter's morning routine, did I actually feel tired enough to sleep. Yes, the irony of sleep... you only get it when you can't have it. I tucked away my exhaustion and downed a couple extra cups of coffee. After dropping two equally tired girls off at their respective schools, I was on my way to the speaking event. Now here is the thing... when you are tired, your emotions are heightened. While I felt fine on the drive and arriving at the school, I was completely unprepared for my response to this video. And I am sorry if it made you feel the way that I did, but I needed to explain my story. My two dear JDRF friends played this video right before I was up to speak. I should have known I was going to be a mushy mess because moments before the presentation, one of my friends handed me a wad of Kleenex and gave me a comforting pat on the shoulder. So as my sleep-deprived mind slowly falls apart, I now have to get up in front of this large group of high school kids and help persuade them to pick JDRF. At the same time, I can't stifle the tears, so I let them go. I decide that I might as well let this group of young people know what type 1 diabetes is really like and I open with that thought... 'Type 1 Diabetes is hard'. As I talk to the kids about my daughters, their friends living with type 1 diabetes and the many adults that still do not have a cure, I notice that by the end of the presentation, a few are quietly tearing up too. I summarize why it is so very important to help JDRF find a cure and I listen as the kids clap. A few come up to say thank you to me and to offer a hug of support when I am done. Sigh. Such sweet kids, too. Some even dressed up in ties and business suits. If I was less overwhelmed, I would have loved to stay and hear their thoughts for each of the presentations. Truly, this is a group of kids that will one day be our future leaders. However, at this point, I just want to find that wad of Kleenex and make a speedy get-a-way. At the entrance of the room, a new family appears. A beautiful, pale, thin child wearing a karate gi has appeared. She is flanked by her mother and her father and they are holding her up as she makes her way towards me. Clearly the little girl is ill. We lock eyes for a split second and she offers a small smile. She is there to do the same thing as me but to speak on behalf of the Cystic Fibrosis Foundation. My tears flow again and I feel the room spin. I give my hasty good-byes to my JDRF friends and head out. The unspoken thought that runs through my head is akin to the horror of dealing with disease; for the child in the karate gi, for her parents, for my girls, and for the Naturally Sweet Dad and even myself. Please, research. We ALL need a CURE. The infusion sites work nicely with the insulin pump. The carbohydrate counting calculates a perfect dose of insulin. The blood sugar behaves just like it would with a person whose pancreas still functions properly. Heck, even when a new transmitter for your beloved Sigums (DexCom)arrives in working condition! Those are the good days. The ones that allow you to relax. I think we all enjoy the moments like that. It gives us each a second (or two) to breathe without fear or worse, panic. But not everyday is a good day. Some days are hard. And let me emphasize the truth. Some days are very, very, very hard. I think if I say 'very' three times, than the emphasis can not be overlooked. In the same way that all things diabetes related can click together, they can also fall apart. The infusion site kinks or enters in on a spot where there is scar tissue. Insulin can't get through to the body, the site kinks or maybe you even realized that a well marked food item clearly had a miscalculation on the number of carbs per serving. I could go on and on, but frankly, just writing about the things that can go wrong, actually leaves me feeling physically stressed. Because these things happen frequently enough that you can feel powerless against them and really, all you have left is a bunch of unmitigated stress markers. Well, I choose to PHONE A FRIEND. And not just any kind of friend. I choose a friend that gets me... the sleep deprived, crabby and slightly hysterical me. And after we talk it out, we laugh. It's kind of like a magic trick. Because really, no matter how bad things may seem, when talking to friends, some days are good days. A few months after her sister was diagnosed. I have this memory of my two little girls. We are sitting near our youngest daughter's hospital bed and our oldest daughter is whispering to her sister. What she is saying, I am not sure but it appears to be soothing and I can tell that it is making our youngest feel better. I decide not to interrupt and let them continue. In hindsight, I realize that this is our oldest daughter's gentle introduction to type 1 diabetes. Our very first walk, when only one was diagnosed. On that same day, I also remember thinking of how mixed my emotions were to have one child diagnosed and one child not. None of it felt fair and I remember having anxiety over how to parent this new situation. Would I be able to overcome an intrusive disease and to bring my once happy home back to life? Could I balance their individual needs? Would they be able to understand the complexity and challenges that type 1 diabetes brings everyone living in a home? Figuring it all out after our life was turned upside down. All of my questions were answered over the next three years and yes, our happy home was returned to a new kind-of-normal. It was never the same as it had been before diabetes but it felt better and we still had laughter and silliness and love. To me (and to the rest of the family), that was all that truly mattered. A photo shoot in the fall before she was diagnosed. Then, shortly after enjoying a victory diaversary for our second child, our happy world collided with t1d yet again. Exactly three years and three days later, our new normal was re-adjusted to receive a second diagnosis for our oldest child. Seeing this now, I am reminded of how simple it was. There was no escaping the tears. We cried. All of us. Most especially our youngest daughter who later asked me if she 'gave' it to her sister. A long six months after diagnosis when she started needing insulin hourly. Nothing was different with our grief. It hurt just as deeply as it did the first time. Running away to New York City to escape the daily grind of t1d. This was taken at the boathouse and she had high bgs. Lots of water and a Diet Coke for a treat. Except that this time, I was certain that we could handle her diagnosis. Just four years later and life is back to a new normal for all of us. And it really wasn't about me as a parent but more about amazing she was. Taking it all in stride, she had a quiet introduction into the world of diabetes on the day her sister was diagnosed. even if it was to just make her little sister feel better. 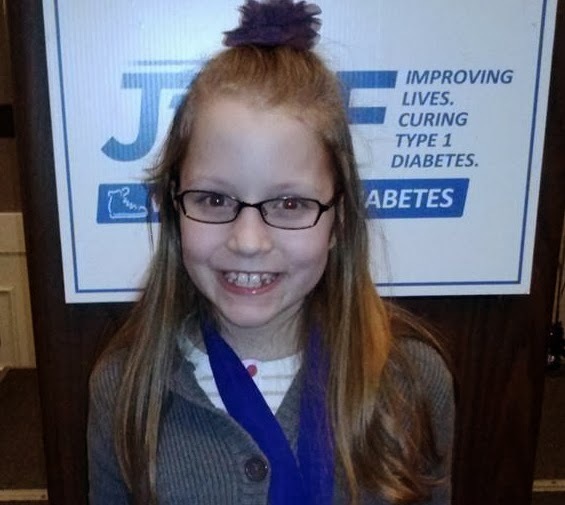 At our JDRF awards banquet, we celebrated her victory as a two term ambassador and as a wonderful fundraiser dedicated to finding a cure! To my oldest daughter, I am so proud of you. "Mom! I am 85! Can I eat?" I glance at the clock and read 5:50 p.m.. Dinner is a mere ten minutes away estimated finishing. Tonight we are having pasta and sauce with a side salad. It is a simple dinner and all I need is for the pasta to finish cooking. I holler back. "You're fine! Dinner is almost done." "But I am lowwwwwwww! And I am hungrrrrrrrry!" She yells again. Feeling impatient, I tell her to wait as I am draining the water off the pasta. The steam is filling my eyeglasses and I am having trouble concentrating on not getting burned and talking to an impatient child at that the same time. "Just wait!" I say with the same impatient tone that is also in my head. The hot water jumps up and bites me squarely on the knuckles, making me whimper. Suddenly, a sound cuts through the noise and pain and I can hear a can of glucose tabs being opened. The bottle is new and the plastic wrap is making a tell-tale crinkle noise. I drop the rest of the pasta into a bowl so that I can figure out where the sound is coming from. Walking past the bathroom, I see the same hungry daughter that I had just asked to wait, eating glucose tabs. "I am low and I know it said 85, but it feels lower. I need something now!" She says defiantly. As if on cue, Sigums (our CGM) bleeps a warning... 67 mg/dl and pointing down. Shaking my head at the situation, all I can do is tell her that I am sorry and that I didn't realize that her blood sugar was dropping so quickly. We sit quietly until the low feeling has passed and then, I hug her and apologize again. Later that night, I tell the Naturally Sweet dad the story and he in turn, gives me a hug and tells me it is going to be alright. And while I know it really is alright and we are fine, I can't help but once again feel a deep ache for what type 1 diabetes continually delivers to us. Some days are just so hard. Youngest daughter shortly after diagnosis. I see her tiny little medical bracelet that would now only fit a doll. Just seven years ago, I held her little hand and cuddled her as best as I could from her hospital bed. 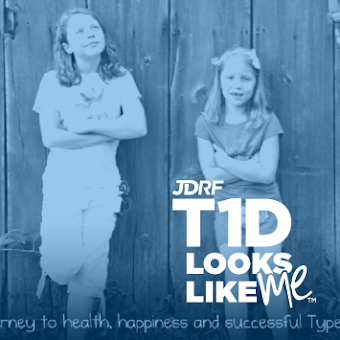 Neither she nor I knew anything of the world of type 1 diabetes. Today, after a lifetime of learning (or so it feels), we still cuddle and hold hands. She is still that same baby girl, just a bit older. Yesterday, at our annual JDRF Walk to Cure T1D awards banquet, she and I accepted awards for our Naturally Sweet Sisters fundraising efforts and for our support of advocating as a walk co-chair, mentor and family coach and as a two-time JDRF child ambassador. While she has taught me more than I thought I would ever know about the world of type 1 diabetes, she has also shown me that life is full of possibilities. She never tires of the idea of finding a cure or in supporting others that walk along our same path. "When I get my cure, I want to come back and dance!" She threw open the car door while grumbling and tossing books into the back seat. As a mother just 'knows', I knew instantly that something had gone astray during her school day. After the books landed with a thump, she slammed the door and turned to me while taking a deep breath. Quietly (and impressively controlled), she said, "A jerk in PE asked me about the site on my arm." "OK." I said with a bit of caution not sure where her conversation was leading. "He said, 'What is that thing on your arm?' and mom, I was like, 'It is my insulin pump site.' Duh! Geez. He made me feel bad." The words were tumbling out of her mouth faster than I could think. Tears welling up in her eyes, she sighed and continued on. "I felt so self-conscious that I told the teacher that I was cold so that I could go back into the locker room and grab my sweatshirt. Then, I felt dumb because I was sweating and I couldn't take the coat off. It was miserable, mom." As she talked, a couple of fat tears angrily spilled out and raced down her cheeks. I reached over to wipe the tears away but she moved her face, slightly embarrassed that it got to the point of tears. Quietly (starting to fill with mommy-bear anger), I said, "I am so sorry. Was the boy teasing you? Was he asking unkindly?" "No. No. No." She shook her head. "It was just that he asked. Why did he have to ask? We were in line and everyone heard. Then everyone looked. I hated the attention. Just look away if you don't like it." She explained that he didn't say anything except that and no other student spoke up either. Carefully so as to not cause any further hurt I tried to explain the situation from another angle; the boy. "Honey, I think he was just curious. Yes, it was thoughtless and rude, but he clearly wasn't even thinking about your feelings. He most likely hadn't noticed your site before and just wanted to know. It doesn't sound like he was teasing or picking on you. Do you think that too?" "Yes. I guess." Her eyes were cast down and she was sitting with her arms crossed, holding her sweatshirt closed. "It was just embarrassing." Gently, I explained that I thought it important for her to be kind when someone innocently asked. Perhaps one day, they will meet someone else that lives with type 1 diabetes and it will help them handle a situation better. We talked about a low blood sugar situation that I heard of where a bystander was able to help after seeing an insulin pump. Listening, she nodded her head in agreement. Then, I further explained that I knew this was a lot to ask and that she also has every right to a private existence, where she does NOT have to explain to anyone unless she wants to. The key is to understand the difference between someone asking out of natural curiosity and one who is being mean. "After you told him, what did that boy say?" I asked. Laughing, she said, "I think I scared him a little. I kind of growled a little and he just said, 'Oh OK.' and backed off." I hugged her and told her that I knew it was hard to be the center of attention for something that she doesn't necessarily want to be reminded of at the same moment she is doing a fun thing, like P.E. class. "One more thing though, sweetie. I don't want you to ever feel ashamed of living with type 1 diabetes. You don't have to wear a coat to hide a site or to not have to explain why you have a infusion set on your arm. You are perfect exactly the way you are. It's up to the rest of the world to catch up with you." C'mon world. Catch up to this amazing young lady! Stop and smell the ivy! Thanksgiving was a much needed break for our Naturally Sweet Sisters family. We enjoyed time with family and friends and spent a few moments actively counting our blessings. Each of us rested, relaxed and for the most part, let the weight of the world (from the past few months) slowly ease away from our shoulders. Arriving with a thud and sending us right back crashing into the reality of all things that make up school, work, household chores and December mayhem. I didn't like it one bit. In fact, I am protesting. Tonight, there will be movement from our new girl Elf aptly named Ginger. We may skip the evening news in favor of a Christmas movie and dinner? Well, it may include eating while playing a board game. Tomorrow morning, two excited girls will open a day on the Advent calendar and for hubby and I? Well, we will savor TWO cups of coffee with a hefty splash of peppermint mocha and sit quietly together before rushing off to get ready for work or pack lunches. We have decided that this year, we will enjoy purposefully putting on the breaks during what can be holiday madness and enjoying our blessings. Which to us, just happens to start at the top of the list with our little family of four.